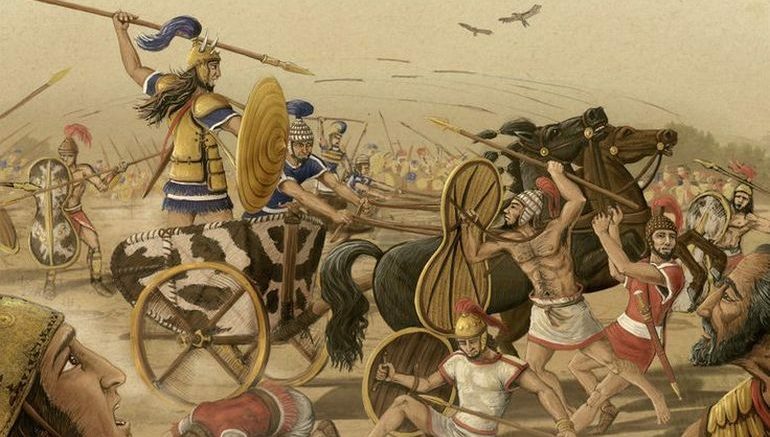 If we consider the historical side of affairs, the Trojan War (or at least its approximate military scope) described by Homer’s Iliad possibly harks back to the period corresponding to 13th-12th century BC. And while our modern day notions associate Greece as a singular entity, historically the small region and its proximate areas, even during Bronze Age, were divided into rather independent entities that were precursors to the later city-states. In essence, while the Trojan War was fought by the Greeks as a united military front, they themselves were not politically united – and thus the many characters of Iliad hailed from a range of different kingdoms and states. 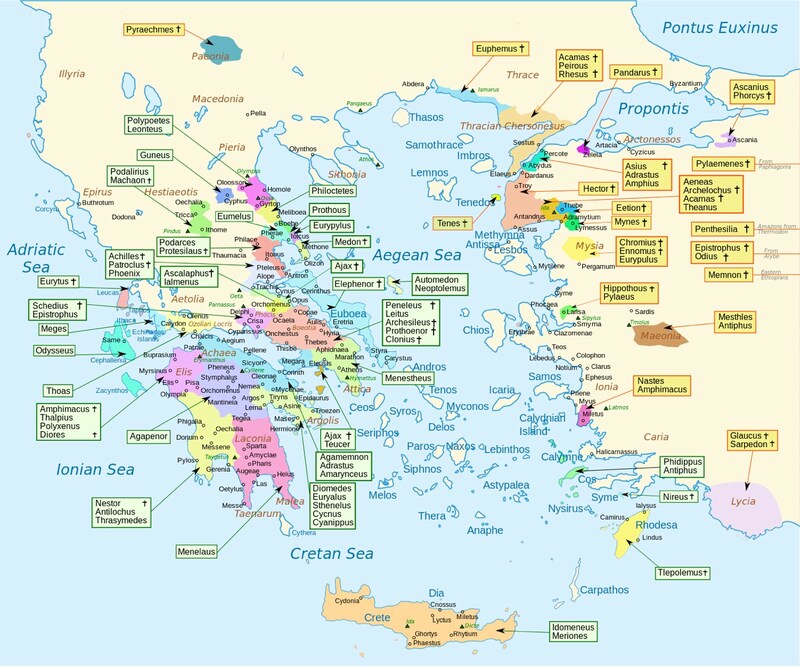 To that end, a map representing the homeland of most of the characters in Homer’s Iliad had been made, with the aid of the ‘Catalogue of Ships’ and the ‘Trojan Battle Order’. Both of these sources pertain to epic catalogs in Book 2 of Homer’s Iliad that respectively list the contingents of the Achaean army that sailed to Troy and the allied contingents that fought for Troy. Reverting to history, scholars are still not sure about the credibility of both these sources. The debates over these catalogs mainly arise over three points – if the lists were compiled by Homer himself, or if they were sourced from earlier memorized traditions that entailed Mycenaean cultures, or if they were developed in a period after Homer’s lifetime. Open in new tab to enlarge, or click on this link. Simply put, the catalogs remain incomplete in the sense that they do not cover all the known characters from the Homeric works. The map reflects such a scope, and thus should be viewed as a rough representation of the homelands of many such ‘cataloged’ characters. And finally since we brought up the ambit of actual Bronze Age Greece, Mycenaean as a term was probably as much ‘mysterious’ to ancient authors as the civilization is puzzling to modern scholars. In fact, Classical authors were not even aware of any singular Mycenaean faction – and given their Greek traditions, such writers often attributed the specific geographically-limited tribes as their ancestors, like the Achaeans and the Argives. Now of course, the greatest example of Classical Greeks being inspired by their ‘ancestors’ comes from the epic poetry of Homer in Iliad and Odyssey. And while the popular historical sentiment hints at how Homer was actually talking about the Mycenaeans, much of the Trojan War is set in a date that only tentatively corresponds to Mycenaeans. To that end, rather than a historical exposition of how Mycenaeans fought and behaved, the Iliad should be viewed more as a compilation of folkloric traditions that were passed down through generations from around 9th-8th century BC (three centuries after the passing of the Mycenaeans). 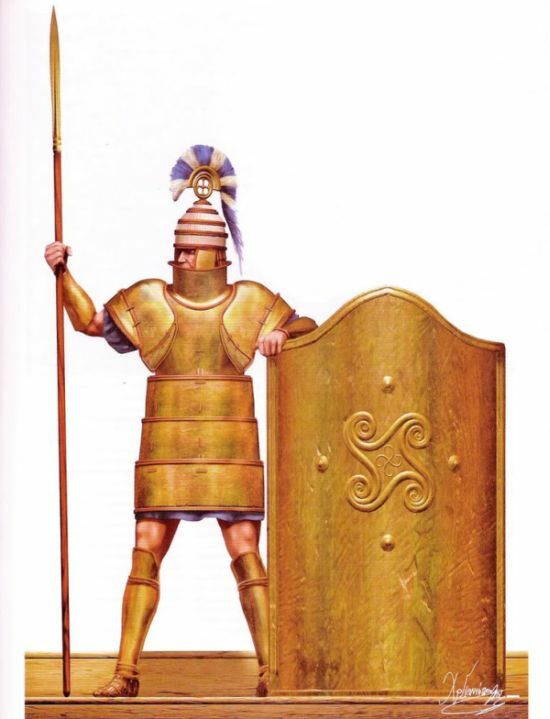 This curious full body Mycenaean armor encased in robust bronze plates pertains to the incredible specimen of what is known as the ‘Dendra panoply’ (circa 15th century BC). However, given such ‘folkloric’ credentials, it doesn’t mean that Homeric works are completely devoid of actual historical scenarios. But alongside the oral traditions, many of the storytellers also invented their own mythical stuff that were ultimately added on to the epic works. And in an odd twist of fate, it was the romanticism of Homer’s literary achievements that ultimately drew archaeologists to the previously ‘unknown’ Mycenaeans. That is because in late 19th century, it was Heinrich Schliemann, a German businessman, who wanted to prove to the world the actual existence of the Trojan War heroes. He came upon an ancient Bronze Age tomb with a myriad of grave goods, including gold, silver, ivory and ceramic artifacts (including the famed golden ‘Mask of Agamemnon‘). Though initially thought to be the royal tomb of Agamemnon, it was later assessed to be the burial complex of a dynasty that existed about 250 years before the supposed Trojan War (of 13th century BC). Thus a forgotten Greek civilization came to ‘life’ in the archaeological realm, and they were known as the Mycenaeans (derived from the fortified Mycenae site, in Argolid). For a larger version of the map, follow this link from Wikimedia.